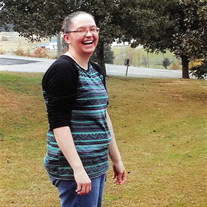 Priscilla Marie Cantwell, age 30 of Bulls Gap, an amazing mother, wife, daughter, and lover of God, went to be with the Lord on December 4, 2018. She was saved on February 16, 1997 at the Country Church and was a member of Riverside Primitive Baptist Church. She was preceded in death by her brother, David Rowlett; papaws, Bill Davis and Marion Rowlett. She leaves to miss and look forward to meeting on the Clouds of Glory her husband and best friend of 11 years, Derrick Cantwell; her two beautiful Momma's Boys, Elijah and Noah Cantwell; mom and dad, Junior and Priscilla Rowlett; mamaws, Mary Ann Davis and Margaret Young; father-in-law and mother-in-law, Marty and Pam Cantwell; brother-in-law and sister-in-law, Brad and Logan Cantwell; nephew, Dresden Cantwell; along with a host of family, friends, and church family. Funeral service will be 2:30 p.m., Sunday, December 9, 2018 at Alder Funeral Home with Rev. David Alder, Rev. Dickie Watts, and Rev. Travis Lipe officiating. Interment will follow in Hamblen Memory Gardens. The family will receive friends 4:00-8:00 p.m., Saturday, December 8, 2018 at Alder Funeral Home.